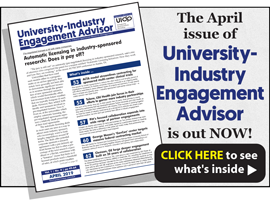 Building strategic corporate partnerships that lead to research sponsorships, technology licensing, workforce development programs, recruiting, and philanthropic support has become a critical imperative for many universities. And while a vibrant level of holistic engagement with industry is the goal, many schools face the challenge of limited resources coupled with a confusing array of decentralized access points for industry. That makes it not only difficult to fully leverage corporate relationships, but also nearly impossible to accurately quantify the impact of industry engagement efforts and measure performance over time. You CAN break through the silos on campus to both present a welcoming front door to corporations and capture and centralize data to gather meaningful metrics and performance benchmarks. That’s been an ongoing process at Virginia Tech, culminating in the recent launch of LINK, The Center for Industry Partnerships. In November we tapped Brad Fravel, MBA, PhD, Director of Business Development for Virginia Tech and a leading force within the Network of Academic Corporate Relations Officers (NACRO), to present this critical webinar: Metrics and Benchmarking for University Corporate Engagement: Breaking Down Silos to Gauge Performance. Based on rave reviews and high continuing interest in the topic, we’ve scheduled an encore of the recorded program for Thursday, March 21. This one-hour session provides a roadmap to bringing your corporate engagement efforts into a more cohesive, holistic strategy, and gathering, organizing, and reporting the data you need to gauge the effectiveness of those efforts, report on your progress to stakeholders, and point you to areas needing improvement. For complete details or to register, CLICK HERE.